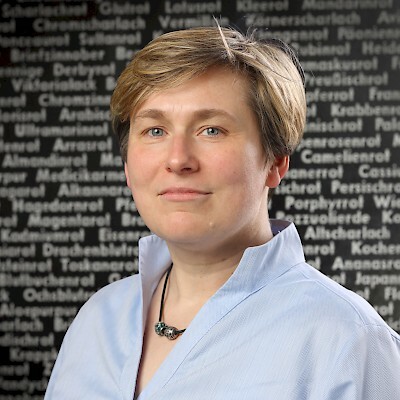 Katharina Lorenz recounts her research process in answering the question: how – or by what analytical means – can we use mythological imagery reliably to write about ancient societies? And examines the benefits of this. Her book, Ancient Mythological Images and their Interpretation, is available now. During my undergraduate days I was struck when I learned that mythological scenes on Athenian vases might relay more than merely entertaining mythological stories. 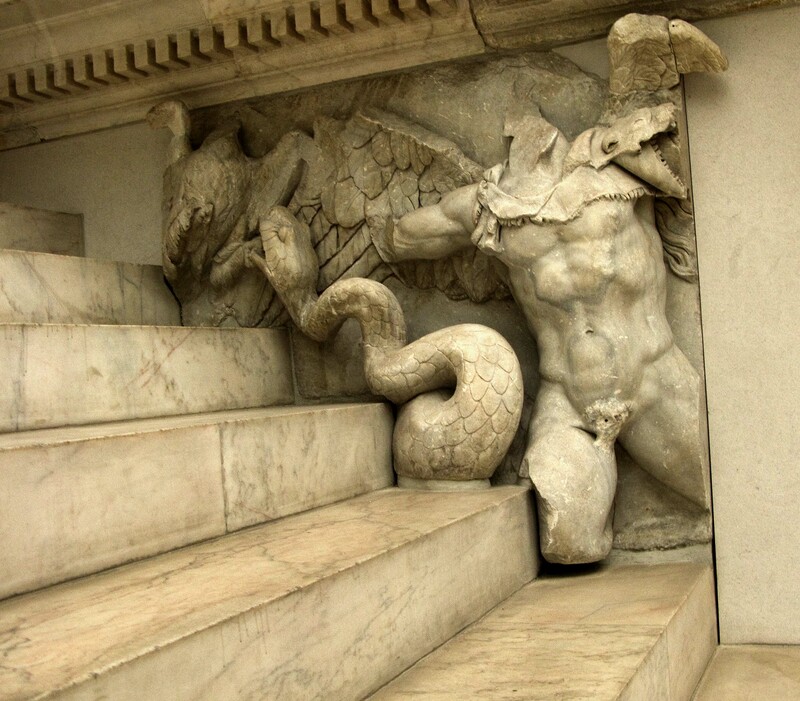 With Ancient Mythological Images and their Interpretation I wanted to establish answers to questions that have been at the heart of my research ever since: that is, how – or by what analytical means – can we use mythological imagery reliably to write about ancient societies? And what do we gain when we use a particular method – and what might we be missing or even losing? For the book I chose empirical experimentation on three types of mythological imagery – a Classical Greek pot, a frieze from Hellenistic Pergamon and a second-century CE Roman sarcophagus – to find out what questions these pictures might be competent to answer and to demonstrate how theoretical approaches to images (specifically, iconology, semiotics, and image studies) impact the meanings we elicit from Greek and Roman art. Let me give you an example of the differing impact of each analytical method as it emerges from the experiment. We will look at the figures of the goddess Athena (fig. 1) and the giant Bronteas (fig. 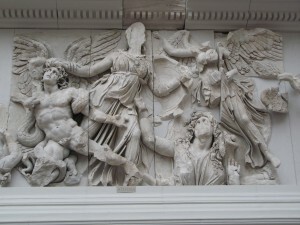 2) from my second example, the Great Frieze of Pergamon, today in Berlin, my hometown. From the vantage point adopted by iconology, the depiction of Athena articulates the pervasive power of the gods portrayed here and also expresses the Great Frieze’s complex relationship with Athenian art, specifically the Parthenon. Meanwhile, the depiction of Bronteas confirms that on the Great Frieze a hitherto unseen iconography has been chosen for the giants: that is, their characterisation as hybrid creatures, with animal features such as snake legs, or wings on their backs. The semiotic perspective, with its interest in modes of depiction, focuses on Athena’s role as daughter and as a reference to the Parthenon, and it also considers Athena’s extrication of her opponent from his allocated sphere, the earth, not least in order to explore the display of female violenceon the Great Frieze. In turn, the figure of Bronteas is representative of the semiotic approach’s dissection of the merging of the giants, as animal hybrids, with the wild forces of nature, an investigation that highlights the giants’ juxtaposition with the gods and their divine command over nature. 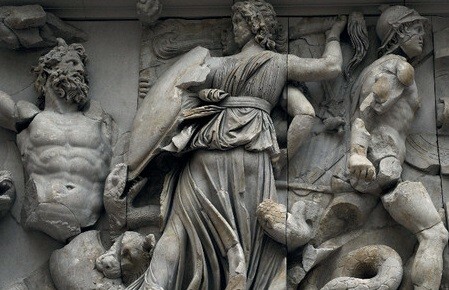 Finally, the emphasis on the performative iconography of the frieze pursued by image studies draws out how the figure of Athena in her role as a reference to Athenian state art is supported by the design of the wider spatial context of the altar. And image studies’ analysis of the locating of Bronteas’ body in part on the stairs of the building leads to a deeper understanding of the display of divine power and of the invitation to the viewer to enter into the actions of the gods. I am currently working further on Classical archaeology’s attempts to give meaning to pictures, now focussing on Roman early-imperial portraiture and the historiography of its study in the nineteenth and twentieth century at the Morphomata Centre for Advanced Study, a research group concerned with the genesis, dynamics, and mediality of cultural figurations; you can listen to me talking about this topic here: https://goo.gl/qK51Q0.